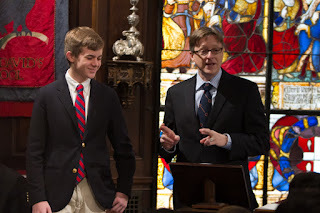 At Chapel Friday, Student Council President, Skakel M. and I, kicked off year three of Saint David’s School Ethiopia project. Launched in celebration of the School’s Sixtieth Anniversary in 2010, our aim was to raise the $100,000 necessary to build a school for a small village in Tigray, in the northern region of Ethiopia. This will be the third successive graduating class that has assumed the leadership responsibility for Ethiopia. Saint David's teamed up with Mimi’s Building Blocks and Save the Children to help us achieve our goal of bringing a school to a community that needed one, much like our founders did for Saint David's--"pass it forward." Ethiopia’s children have been profoundly affected by decades of conflict, food insecurity and poverty, and as such suffer from some of the world’s worst education and health indicators. Children under the age of 18 account for roughly half of the total population of approximately 80 million, resulting in high demands on basic services that the government struggles to meet. Although children’s access to basic education has increased significantly over the past decade, schools are failing to prepare learners with the building blocks they need to succeed in school and in life. The Kalina 'dass' school is located in the Southern Zone of Tigray, in Kukuftu, a frequently drought-stricken community 138 km south of Mekele. Kukuftu’s 496 households (367 male-led, 129 female) rely on traditional farming for their livelihood and the community grows sorghum, corn, and lentils. Though the people in the Kukuftu community are poor, they have great interest in education and recognize the importance of sending their children to school. The Kalina school currently educates 233 students (117 girls). Because of inadequate resources at the district level, construction of classrooms has not been funded and programs such as teacher training and PTA development have not been adequately supported. Working with the Ethiopian Country Office, Saint David's is helping to transition Kalina school from a dass to a permanent structure with latrines, furniture, hand-washing facilities and basic training for teachers and the PTA. We expect construction to take four months with the first month utilized for preparation, bid and contract agreement. Tigray is a hot and arid region located in northern Ethiopia. Eight in ten families in Tigray depend on agriculture for their livelihoods, but continuous land degradation, droughts and famines, excessive deforestation, over-grazing and continuous traditional ways of farming have played a great role in reducing agricultural productivity. Poverty is endemic. Although children’s access to basic education has increased significantly over the past decade, many locations in Tigray lag behind. Many of the children who do attend school do so at unfurnished open-air “dass” classrooms exposed to the heat, dust and weather, or at rude shelters. Clean water and sanitary facilities are often absent. By building the school, we will improve education and health outcomes for children by improving the skills of teachers, training parents and community groups to help manage the school and support their children’s education. We will also provide learning materials, through our partners, to the school. In the health arena, working with Save the Children, we will focus on the critical health and nutrition factors that keep the Kalina children out of school and reduce their ability to learn effectively. This is an exciting program. The boys have raised more than 3/4 of the funding that's needed. If you'd like further information, please contact us. This past Saturday, the normally quiet 'weekend Saint David's,' came alive with the sound of young voices. Horizons Summer program boys and their families ventured out in the cold for the Horizons Reunion Day. The boys, now all first graders from our four partner schools in Harlem, were so excited to see each other that they hugged and huddled for the first 15 minutes. After settling in, the boys met with their teachers, Mrs. Sanchez and Mrs. Patterson, in the Omega classroom for a morning of reading, music with Mr. Bell, and for sports with Coach Roman. During the reading session, Ms. Kaplan, Saint David's Reading Specialist and Horizons Summer Reading Teacher, assessed all the boys, evaluating their progress since last summer. Pre- and post-testing of fundamental academic skills is an important component of our Horizons program. While the boys were with their teachers, Horizons' parents met in the Smith Room. Their day began with a highly interactive introductory session led by current Saint David's parent, Kavita Dolan. Beginning to build a strong parent network "parent community" was one of the important goals of our first Reunion Day. Parents were then treated to two excellent speakers: Melissa Roessler (Saint David's 4th grade mom; and certified nutritionist), who talked with Horizons' parents about the Art of Eating, and Kim Davidson, Saint David's Head of Lower School, who spoke about the Importance of Reading to children and Approaches to Reading--presenting parents with a range of effective strategies they could try out themselves. Five Saint David’s Upper School boys volunteered to help make the day a success (Julian Anderson, Skakel McCooey, Eric Wu, Tyler Holder and Thomas Harvey). This is a community-wide effort. Pictured above is one of our 7th grade volunteers, donating a Saturday morning to the program. Pizza was ordered for all and Chef Josh, who provided the food this summer, set up a 'make your own ice cream sundaes table' for dessert. Parents and boys were thrilled. Former Saint David's parent, Jill Lampe, Horizons' official volunteer photographer, captured the day on film. Reunion Day ended with parents happily signing their re-registration forms for the Summer of 2013 and left feeling very much a part of the new and exciting Horizons Community at Saint David’s. Overall, Reunion Day was a complete community event with former parents, current parents, current boys, alums, teachers, and administrators all pitching in. It was a huge success! Horizons would not be where it is today without the guidance and leadership of the program's executive director, Julie Sykes. Planning is now fully underway for the summer of 2013. We will be doubling the size of the program as we bring 15-17 new rising first grade boys into the program. If you are interested in learning more, please visit the Horizons' homepage. At the end of the first period. Saint David's White leads Trinity 7-4. Tight game, but White is holding the lead. Here Trinity with possession shoots high at the buzzer, no basket. 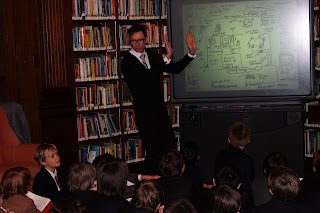 Jack Gantos, author of the Rotten Ralph series of books, visited Saint David's last week as part of the Parents Association sponsored Author Series. Gantos shared his experiences and advice as a writer in sessions with the first and second graders and with the fifth and sixth graders. The younger boys greeted Gantos with a version of the theme song from The Addams Family, with lyrics changed to reflect the plots and characters of the Rotten Ralph books. Since the younger boys read the Rotten Ralph series and, in the spring write and publish their own story inspired by it, they were very excited to meet the author. With the younger boys, Gantos talked about the importance of keeping a journal and what makes a good picture book, divulging his past "mistakes" that led to a better understanding of how to create an exciting, memorable character and fun story. With the fifth and sixth graders, he discussed how they can use pictures and text from their life experiences to generate story ideas, and invited them to do so in their notebooks. Earlier in the day, Gantos met with Saint David's writing teachers to talk about the teaching of writing. 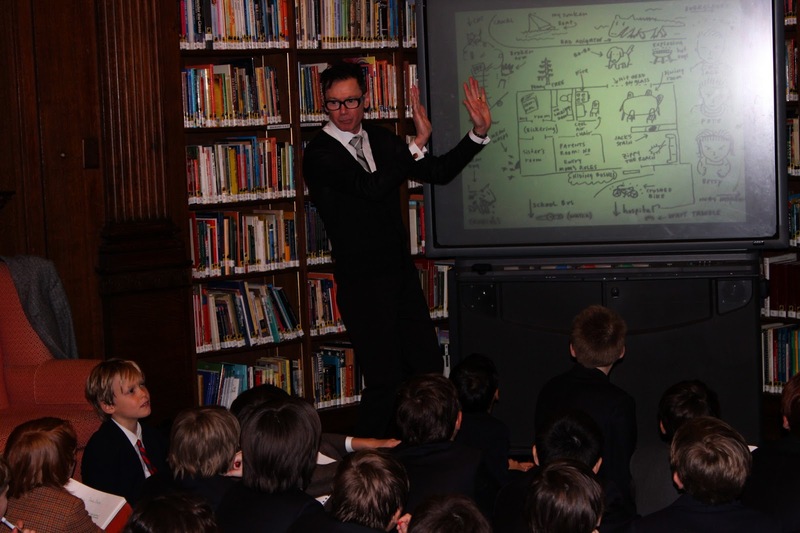 The session was the third visit by an author to Saint David's this academic year. Previous speakers were Jacob Ward, Editor-in-Chief of Popular Science and Josh Chalmers, the author of Change the World Before Bedtime. Video shows clips from sessions with both the lower and upper school boys. Mr. Gantos was an inspiring and entertaining speaker. Everyone loved the outrageous stories he told as he shared how he takes the ideas from his journal and uses them to create books about real life experiences people can relate to. He offered first graders tips for writing their own versions of the Rotten Ralph books, and he urged fifth and sixth graders to write, write, write! One teacher commented after the session: "My boys said they learned that a good writer has to READ, draw pictures to think of ideas and to explain your ideas; you have to start your book with characters and setting, then the problem and solution; write about 1, 2, and sometimes 3 characters (no extra pigeons! ), and that you have to write about what you know (he had a terrible cat, so he wrote about a terrible cat!)." Another commented that, "The boys could not stop talking about it!" and another, "I love that he emphasized the daily commitment to writing and the need for multiple drafts. It’s important for the boys to understand that the process of revision is ongoing and that they need to look at their work through different lenses to get it just right." Mr. Gantos' presentation provided an incredible learning experience for the teachers and the boys. Eighty-seven Heads of independent schools in New York City, including myself, have written a letter to the President and our nation's leaders, which ran as a full page advertisement in The New York Times. The recent tragedy at Sandy Hook Elementary, another in a long line of tragic events involving gun violence and schools, has compelled my colleagues and me to speak out. We are not an organized lobby or political action group, but simply a collection of like-minded independent educational leaders speaking out with a call for action. As the recent events in Newtown and the scenes of other mass shootings teach us, the easy and virtually unrestricted availability of highly lethal, semi-automatic assault weapons and high-powered ammunition place our schools in jeopardy, most especially our children, the youngest and most vulnerable among us. Never before have so many Independent School leaders in our region spoken with one voice on behalf of a single issue. We are moved to do so out of a duty to our students and all of our nation’s children. We stand ready to help in this effort, and encourage our colleagues leading schools across the country to join us. Above all, we demand that reason and compassion prevail when it means protecting our society’s most vulnerable members. This morning, Saint David's Philharmonic Ensemble performed a special morning concert for all the Lower School boys from Pre-K through Grade Three. Coming on the heels of yesterday's first rehearsal of The First Orchestra (our new orchestra for boys in Grades One through Three), the younger boys gathered in Hyman Hall and watched, rapt, as Ensemble Director Phil Hough took them through the Ensemble's rehearsal process, from warm-up to an introduction to some of the orchestra's sections and instruments with which they might not be familiar. One of the younger boys was invited to take the conductor's baton at one point and conducted the ensemble for a few measures of music. 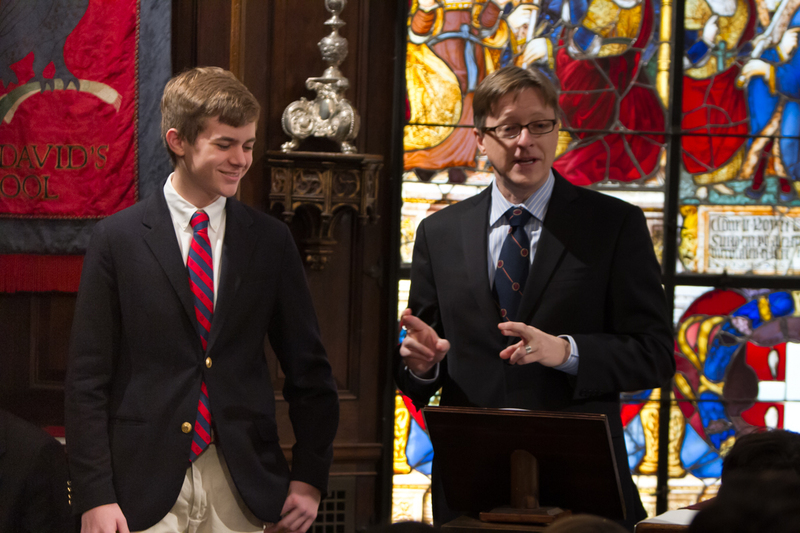 The boys then enjoyed the Ensemble's performance of the Masterpiece Theater theme, Bach's Brandenburg Concerto No. 5, and a selection, the prayer in the woods, from the Engelbert Humperdinck opera Hansel and Gretel. An exciting day today at Saint David's! Fourteen First, Second and Third Grade boys arrived early to school this morning to launch one of our newest programs at Saint David's: The First Orchestra. Making their way up five flights of stairs, the boys met their director, Ms. Anderson, who welcomed them inside. After a few pointers on ready positions for playing in an orchestra, the boys quickly dived in with gusto. Saint David's has a long and distinguished classical tradition. This commitment and the role of orchestral music at Saint David's took a whole new and important step forward today. Joining the Philharmonic Ensemble, The First Orchestra, which is focused on strings, now introduces the 'collective, group experience' to boys at a much younger age, expanding our ensemble performance program all the way from the First through the Eighth Grade. The First Orchestra, like the Philharmonic Ensemble, rehearses weekly. Always innovating, Saint David's is constantly looking for more and richer mission focused experiences for our boys. First Orchestra promises to deliver just that. You'll be hearing more as the months unfold. Responsive Classroom: During this three-hour workshop led by representatives from Responsive Classroom, Lower School teachers practiced “interactive modeling”– an approach that teaches children to notice and internalize expected classroom behaviors through “positive teacher language”– using specific words and vocal tone as a tool to promote children’s active learning, sense of community, and self-discipline. 'Responsive Classroom' is a series of strategies and classroom activities and procedures that promote a sense of 'classroom community'--a way to listen, respect and work as a contributing and productive member of a community. Case Studies with our School Psychologist: In small group sessions, Lower School teachers met with the school's consulting psychologist to discuss how best to address a range of learning style needs in the classroom, group, and in individual instruction/interactions. Children learn in very different ways. In these small group sessions, teachers shared, and our school psychologist advised, on best practice, effective strategy implementation. They also examined and trouble shot 'ineffective strategies' in teaching and working with a variety of styles of learning. Prepare Inc. Workshop: Upper School teachers, in a series of extended sessions learned more about the program that has been implemented for our sixth and eighth grade students as they participated in a series of discussions and role playing exercises focused on personal safety, bias recognition, micro-aggressions, and bullying. The social dynamics for boys in their teenage years change significantly from their childhood years. Addressing the more challenging social dynamic aspects of these changes in a positive, frank, and deliberate way is an important part of our program. Educating and informing our teachers about all this work is equally important. Examining Student Profiles: In a series of sessions, Upper School teachers met with an experienced psychoanalyst and clinical psychologist, for a round-table discussion about practical strategies for helping students further develop and enhance 'executive function'--an important learning skill that transcends many other learning skills. One of our senior faculty members commented at the conclusion of the day, "Saint David's felt like a mini-university today; as I went from workshop to workshop, I felt like I was back in graduate school." Our school-wide theme this year was fully explored through a specific educational lens today. A great day!